As a Wealth Advisor, I am a member of the TD Private Client Group who works with an exceptional team of Wealth Professionals which include Portfolio Managers, Investment Advisors, Private Trust Officers and Business Succession Planners that help deliver peace of mind to our Ultra High Net Worth clientele. Together we assemble a comprehensive plan which covers the complexities of Tax Planning, Cash Management, Long Term Investing and Estate Planning. Given my long term experience I am able to navigate and guide my clients through all the stages of their lives with the utmost care and professional advice. I have over 29 years of Retail Banking and Wealth Management experience and worked for several large Financial Institutions and with TD Bank Group for the past eighteen years. 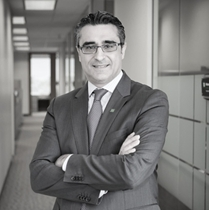 My Experience at TD Bank include, Retail Bank Manager – TD Canada Trust, Private Account Executive – TD Wealth Private Investment Counsel, Senior Regional Manager – TD Wealth Financial Planning, and Wealth Advisor – TD Private Client Group. In addition to my extensive Banking and Wealth Management experience, I've acquired the following professional designations: Fellow of The Canadian Securities Institute, Professional Financial Planner, Financial Management Advisor, Certified Retirement Planner and Chartered Strategic Wealth Planner. With my combined career and educational background I am able to provide a holistic approach to all facets of your banking and Wealth Management needs. I was a former member of the TD Triec Mentorship program – which help immigrants new to Canada integrate into the Canadian work force. I am married with two children ages 10 and 12 and I enjoy golf, travelling, and spending time with family.